SIDENOTE: If they did pass such a law, I didn’t receive official notification, so hopefully I am safe to continue to frequent lane 5 at the Caboolture Aquatic Centre. Yes, I have my own lane. That is how quiet the pool is here, if you go outside of the dolphins’ training hours. More than anyone else, I myself was painfully aware of my grotesque incompetence in the pool. In my 30-odd years on this planet, I had been blissfully unaware that swimming is such a complicated sport. Of course, I realised I needed help so I enquired as to whether it was possible to attend adult swimming lessons at the pool I go to. Reception lady laughed. I smiled naively back at her. Now, I had already had a few goes in the pool and had started to research the whole triathlon deal, so I was unsurprised that swimming class is called Masters. Triathlon is a nonsensical kind of sport. But I was extremely sceptical about the willingness of other Masters members to have to put up with my offensively bad swimming. To me, it seemed as ridiculous as enrolling a primary school student in a school named ‘Surgeons R Us’. Or consolidating your mountains of personal debt into a loan provided by ‘The Millionaires Club’. Or joining a swimming club called ‘Masters’ when you can’t swim more than three metres. So I decided to stick with teaching myself, following the odd piece of advice that I was lucky to get from Coach Ireland, King Kirk, and the Grimsey’s Clinics, along with the internet and my general intuition. It has worked out quite well – in fact just spending time in the water, relaxing and getting over the fear of drowning has been the most important part of improving my swimming. I don’t suppose you can really ‘coach’ that progress, it simply takes time in the pool doing your best version of freestyle over and over and over again. A couple of months ago, I was reminded about Masters when my friend from the gym mentioned it. Charlene goes to Masters every week and I think she was keen for someone slower and crapper than her to attend also, to make her look good. SIDENOTE: I cannot begin to tell you how happy it makes me that, living in Australia, I have made friends with a lady named Charlene. She even looks a bit like Kylie Minogue from the Eighties, with beautiful long curly hair. For those of you who are from Australia and may not understand this, I can only assume that the equivalent would be an Australian moving to England and becoming friends with someone named Queen Elizabeth with very short grey hair. How does it get any better than that, I ask you. At first, I refused Charlene’s invitation because I knew I wasn’t quite ready and as much as I enjoy making others look good, I don’t enjoy wasting the time of talented people trying to teach me stuff. Even though I was making great progress in the pool, I still had plenty to work on by myself and I felt that going to a class to be told that I need to work on the things I already knew about would be pointless. Charlene Robinson from Neighbours, aka Kylie Minogue of course. Last week I finally hit some kind of jackpot. I had the best swim of my life: it was consistent, I didn’t run out of breath once, I practiced good technique, I quite enjoyed myself. So I got back in the pool a couple of days later to confirm. It was official, I was swimming the best I knew how. I had reached my full potential. It was time to get some lessons. Firstly, I sought out the Masters coach, Jade. Along with being a good swimmer, Jade does crossfit (a sport I am simply not cool enough for) and she ocassionally posts photos of her bleeding hands on Instagram as proof of her badassery, which I find impressive because as much as I am willing to hurt for my sport, I am not sure I want to drip with blood too often. Also, Jade once called me ‘a stealth badass’ as we were discussing how I don’t look like I could go and run a 26.4km trail run, but lo and behold I can. So I believe we have a mutual respect for each other. Having cornered an unsuspecting Jade as she tried to gather her thoughts early one morning, I quizzed her on the likelihood of my (much improved but still pretty poor) swimming abilities having a negative impact on the Masters swimming group. ‘How bad are you?’ Jade asked. I get this kind of question a lot and I never know how to answer. Because I really don’t mind that I’m not very good at this stuff and I am keen to ensure I don’t set unrealistic expectations. But on the other hand, my massive ego looks back at all the hard work I have done and wants to scream I AM EFFING BRILLIANT!!! Jade assured me that everyone swims at their own pace in Masters and I wouldn’t be holding anybody back by attending. She agreed I might learn something to work on and she suggested if I just tried one lesson, I could take a few weeks to work on my newly-taught skills before returning for another one. In other words, I felt, she was saying I could try a lesson and if I was really terrible nobody would raise the subject ever again or force me to go back. Sold! I signed myself up. Well, I told Jade I’d be there next time. So yesterday morning, still sad about the distinct lack of Sunshine Coast Half Marathon in my future, I woke up nice and early to scoff down some sesame snaps before joining the Masters crew. It was quite nerve-wracking, but as I arrived I saw Charlene just ahead of me, so I was able to babble nervously to her for a minute as we queued to pay our five dollars. Charlene seemed genuinely pleased that I had dared to show my face and she kindly suggested we would share a lane, along with her other friend, Vicky. Sharing lanes hadn’t really crossed my mind, and as previously mentioned I am usually somewhat spoilt at the pool because I am generally there all by myself. There used to be other people swimming in summer, but apparently the Queensland winter has scared them off. It was 17 degrees yesterday morning at 5.15am, so I guess we can all agree they are absolute wimps. I introduced myself to Vicky and tried to warn her that I would be slow and we all laughed as two of us pretended to be slow swimmers and one of us feared losing the most Australian friend a girl could ever wish for when the others inevitably realised how utterly useless she was at swimming. Before I knew it, we were at the pool deck and everyone else was somehow in the water and doing swimming things while I was still trying to fit all my hair into my swimming cap. Jade was great, and called me over to a whiteboard she had wheeled out of the office. She pointed to a list of numbers and words that looked like the very professional lists I had seen real swimmers write under their Instagram posts. You know the type – intimidating. An artist’s impression of the whiteboard that Jade put up. Because I forgot to get a photo before she wiped it down after the session. I looked into the pool. Various aquatic tricks were being performed with confidence and proficiency. I looked back at Jade and apparently she knew what I was thinking. 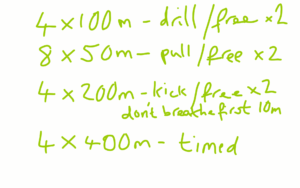 I breathed a sigh of relief: Catch-up is literally the only drill I have ever done, back in January with Coach Kirstie. So all I had to do was jump in and do it. Vicky and Charlene were already swimming and doing their own drills, so I hopped in to try and catch up with my catch-up. Sharing a lane was actually not too bad, especially because having a rest for ten seconds at the end of each lap allowed me to see where the others were and if necessary, I waited an extra five seconds to let them go past me. With the first task completed, I checked in with Jade. She gave me some pointers to improve my stroke, mainly focused on my head position which needed to be more relaxed and lower. She handed me a pull buoy just like Felicity the Float and explained that eliminating kicking from the swimming equation would allow me to focus on making the changes she recommended with my arms and head. It has been a long time since I used Felicity and I found it really hard to stop myself from kicking for the first hundred metres or so. Once I got the hang of it, I was impressed with how well I could concentrate on my arm position and breathing better. Back when I had used Felicity the Float, it was really because I needed her to stop me from drowning. I realised I had never made the most of using a pull buoy to improve my technique, so I have vowed to retrieve Felicity from the bottom of the cupboard and make use of her again. After 8 lengths, I checked in with Jade again, who pointed out I was supposed to have done half of the fifty metre lengths without the buoy. I had got a bit carried away. Lucky for me I didn’t get detention, but next time I will have to pay more attention. 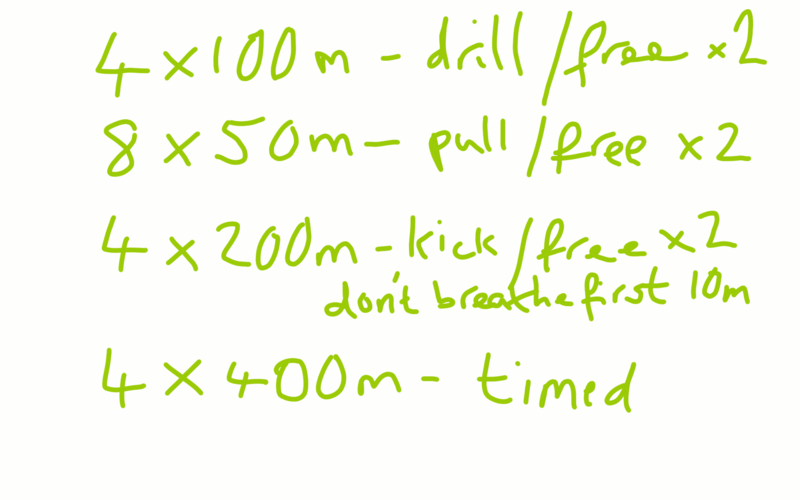 The next task was to do 200 metres of kicking. I stared blankly at Jade. ‘I’ll get you some fins and a kickboard’ she said, before disappearing. I waited, and looked around at everyone swimming away, concentrating on their own struggles and challenges. The atmosphere was serious but not competitive and I felt very comfortable. Jade reappeared with blue things I would have called flippers and a foam board I would have called a float. I put the fins on and held the board in front of me, then set off. Swimming with fins on is the most fun thing I have done in months. It was like I was riding a roller-coaster; I was suddenly able to swim as fast as a professional. I kicked myself along, a bit wobbly but incredibly fast like a duck on performance enhancing drugs. It was so exhilarating I couldn’t help but beam a massive grin at the approaching wall. It was absolutely brilliant. I kept the flippers on for the final task of 400 metre blocks, partly because I was having the time of my life and partly because Jade said to keep them on so that I could catch up with the rest of the group a bit. 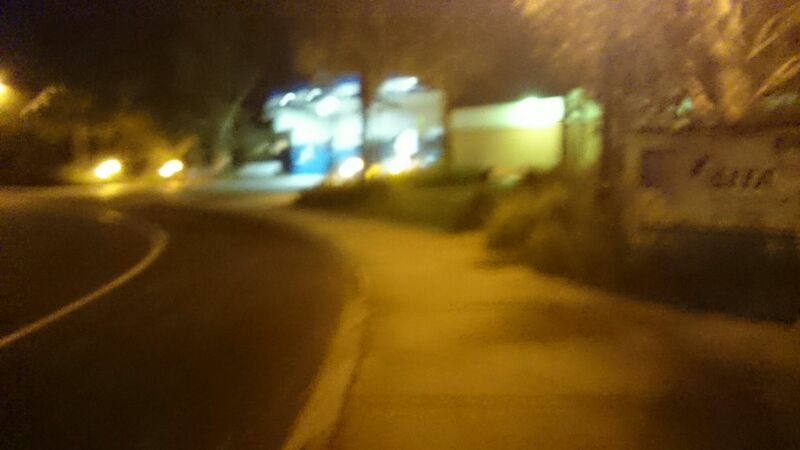 By the time I had done two of the 400s, most of the others were finishing and leaving. Charlene and I were the last to leave. But guess what – Masters was a resounding success. I can’t wait to go back again! For the rest of the day yesterday and most of the day today I have had a wonderful sense of achievement, as well as an underlying anticipation of something super fun to look forward to next week. After moping around at the beginning of the week because of my hip injury, it has been very refreshing to feel so positive. This entry was posted in Show Me Swim and tagged coach, ego, freestyle, newbie, swimming, training, triathlon. Bookmark the permalink. What great timing to try out Masters! Great way to get back on track for the big one.